What to Do When iPhone Erased All Data after Failed Passcode Attempts? So, your iPhone just self-destructed and reset itself saying that you had entered the wrong passcode too many times? Or you restored the device to factory mode via iTunes because your iPhone was disabled?Whatever the cause is, one of the main consequences is that all your data got erased. The question is — does that mean all your photos, videos, notes, etc. are lost for good? In this article, I'm going to show you how to restore your lost iPhone data due to failed passcode attempts. Useful tip: You may be interested in getting an iPhone wallet case, if you often keep your iPhone in a busy pocket and accidentally activate the screen while put your hand in your pocket. When does an iPhone get disabled or erased by itself? The answer is: when you hit the 10 wrong passcode input limit. For your information, here is a table that outlines different screen messages that will show up on your iPhone after you insert wrong passcodes too many times. 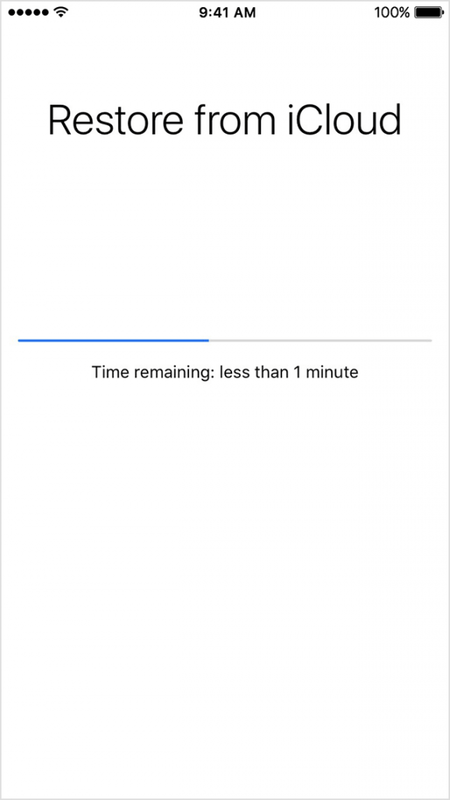 "iPhone is disabled, try again in 1 minute"
"iPhone is disabled, try again in 5 minutes"
"iPhone is disabled, try again in 15 minutes"
"iPhone is disabled, try again in 60 minutes"
In the nutshell, if you enter the wrong passcode into your iPhone six to nine times in a row, you'll be locked out with a message saying "iPhone is disabled, try again in X minute(s)". Until you hit the 10th time, your iPhone will be completely locked out. The last chance you have to make things right is to ensure you enter the right passcode once the "Enter Passcode" window shows again after you connect the device to an authorized computer. But, that only applies to the situation when you didn't enable the self-destruct mode. In other words, the "Erase Data" option under Settings > Touch ID & Passcode (see screenshots below). If you have enabled the option where underneath it says "Erase all data on this iPhone after 10 failed passcode attempts", then once you entered the wrong passcode in the 10th attempt, all your iPhone data will be erased immediately. That's why we called it: "self-destruct". Nevertheless, it is still possible to recover some (or all) of your lost data even if your iPhone has been reset to factory status. How to rescue data after iPhone got erased due to wrong passcodes? Note: the methods below are ordered based on ease of implementation. If one method doesn't work or doesn't fit your situation, simply go to the next one. For example, if you don't have any iTunes or iCloud backups, try iPhone data recovery software. Ideal use: you have backed up your iPhone via iTunes to your PC or Mac, before the device got disabled and wiped out. Just connect your iPhone to the computer you normally use to sync and backup data. Open iTunes app, click on the phone icon to access the main screen like below. Under Settings > Summary, in the Backups section. 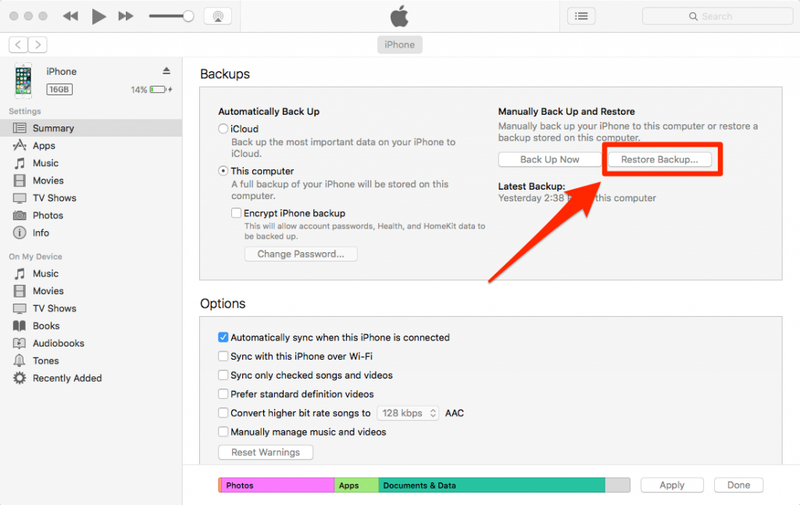 Click "Restore Backup…" and follow the rest instructions accordingly. This article has more. Ideal use: when you have enabled iCloud backup for your iPhone and there was at least one backup available before your iPhone got locked out. Turn on your iPhone, you should see a Hello screen. 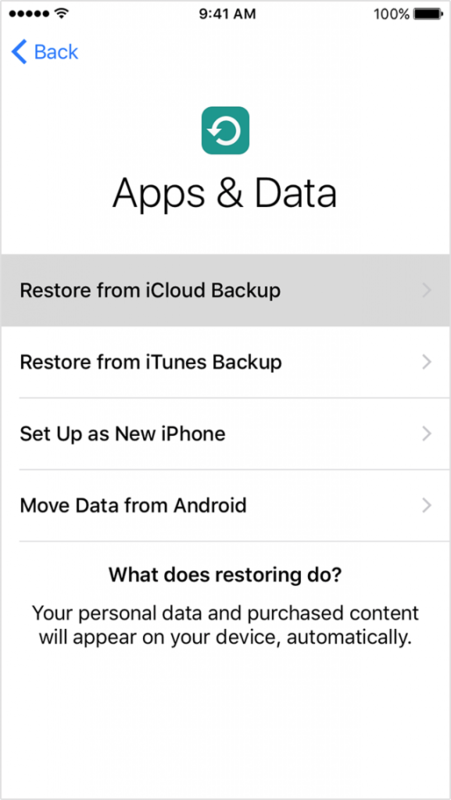 Follow the setup instructions until you reach "Apps & Data" where a few options are available for your choice, one of which is "Restore from iCloud Backup", tap on it and sign in to iCloud with your Apple ID. Follow the rest steps to complete the process. Ideal use: when you don't have any iTunes or iCloud backup, but you still want to retrieve your lost files especially photos and videos. 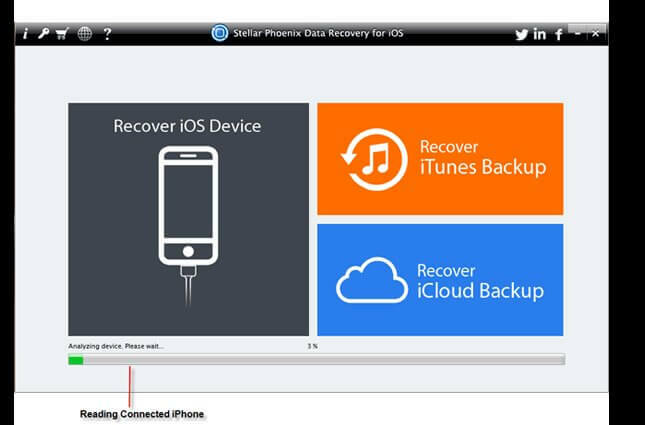 Your last resort is to try a third-party recovery tool like Stellar Data Recovery for iPhone. Chances are that you can get back some files, but it's unlikely that you'll be able to recover everything since your device has been wiped out already. It's worth a try if the data means a lot to you. Stellar has three different recovery modes (as shown in the screenshot above). Start with the "Recover from iPhone" mode. ​Get an iPhone wallet case if you can. This helps avoid mistakenly touching your iPhone when it's in a pocket. Inadvertently disabling the device is surprisingly common nowadays. 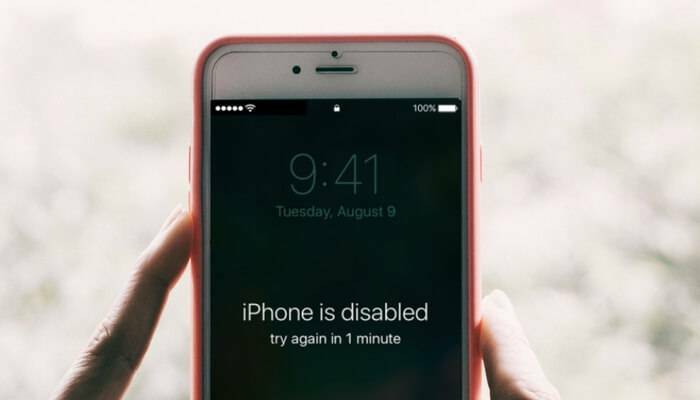 The slide to unlock feature on iPhones can be activated from anywhere on the screen, then pressing passcode entry while perhaps unconsciously to you, can cause your iPhone to be disabled. It's a good practice to set a passcode for your iPhone or other iOS devices to help protect your data from unauthorized access. But make sure you remember it firmly as you may use it in many circumstances. 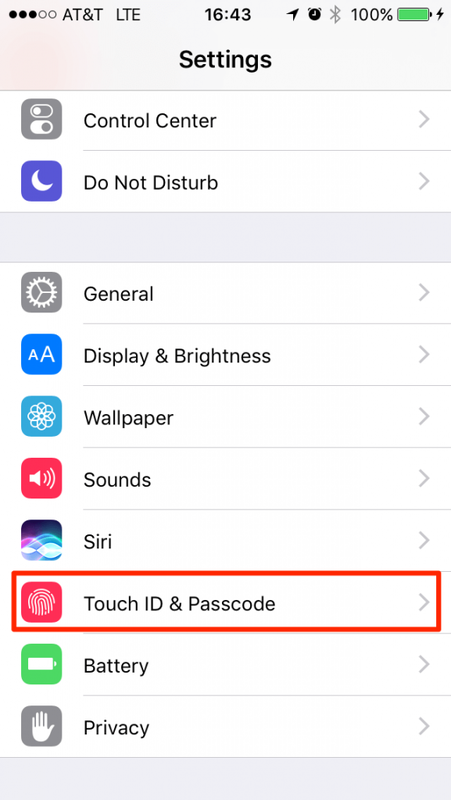 If you have an iPhone 5S or later models (6, 6S, 6 Plus, 6S Plus, or latest iPhone 7) that support Touch ID, consider using your fingerprint instead of a passcode. Turn off the self-destruct mode (the "Erase Data" option as shown above) unless you are absolutely paranoid about device theft. Enabling it often causes more troubles than the value of protecting data. Be cautious when you handle your iPhone to young children, who are always curious playing with technology and might trigger the unintentional passcode entry. Because the kids are often smart enough to find a way onto the passcode input screen, enter the wrong password repeatedly as they tap. Do you know any other useful methods or information about recovering data from a disabled iPhone? Let us know in the comments. My iphone screen is broken and all the times I’ve tried to unlock it, it wouldn’t let me push the right numbers, it kept pushing the wrong ones on its own, now it says its disabled and to connect to itunes but I dont have itunes on my computer and am unable to download it because I have a chromebook, what do I do? Does it erase iCloud id? 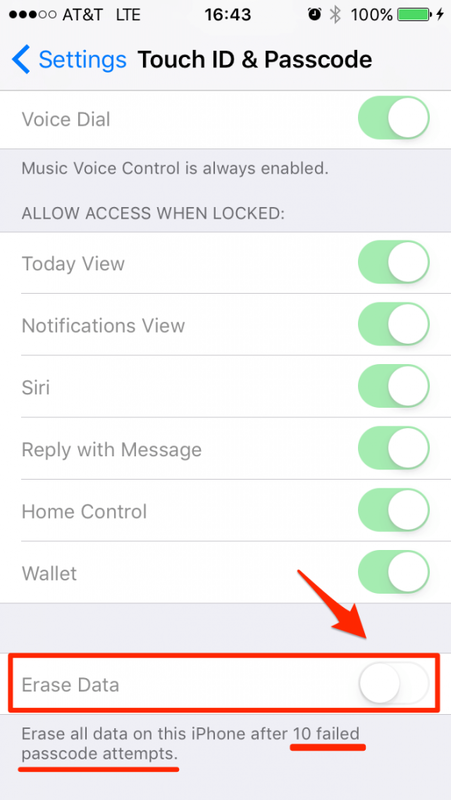 Great description of what do do and what to expect when your iPhone locks. Complete, Easy to Read, Great Visuals. Would like to follow your other articles and suggestions.